Here’s a little time line that shows the progression of events leading up to many conservatives and right wing media personalities attacking Fox News‘ Shepard Smith. It’s amazing how blatant these nuts are in trying to supress the truth. Shepard Smith goes against the grain at Fox News by stating that “We are America! We do not f****** torture!” while slamming his fist on the desk at about the 30 second mark. This video may not be safe for work. Contrary to what other Fox News personalities are claiming ( i.e. 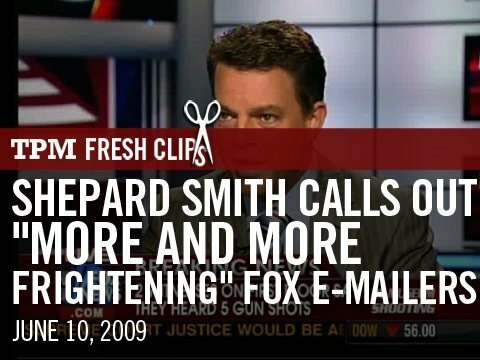 the Obama administration is targeting right wing groups), Shepard Smith shows some journalistic integrity and steps away from the blame game. Smith: So if this bulletin from April 7 looks at the right-wing groups, is there a bulletin that looks at left-wing groups as well? Herridge: Yeah, we were able to obtain that bulletin as well. It came out in January, and didn’t get — there it is — didn’t get the same attention. It looked specifically at groups like the Earth Liberation Front, or ELF, groups that in the opinion of Homeland Security, in the future will try and attack economic targets and specifically use cyber-attacks, because they see that is sympatico, or in concert with some of their other beliefs. So there are two assessments. The one on the left, the one on the right is the one that’s getting the attention because of the leak. … I would point out that both of these assessments, Shep, were commissioned under the Bush administration. It takes some time to do them. They only came out after he left office.